Even long before bridges made them easy to reach, Virginia beaches were attracting tourists from Washington D.C. and other communities on the eastern coast. Virginia offers something for everyone – the lively attractions of Virginia Beach, the quiet and protected sands of Assateague Island with its wild horses, the constantly changing sandy spit of the Bethel Beach Natural Area Preserve, the playgrounds and live music on Buckroe Beach, or the warm and quiet waters off Cape Charles Beach. There are beaches on the Potomac River, such as Colonial Beach, while others are in Chesapeake Bay, where the warm, protected waters are perfect for family outings. Assateague Island is a barrier island just off the Delmarva coast. One third of the 37-mile long island is in Virginia and the rest is in Maryland. 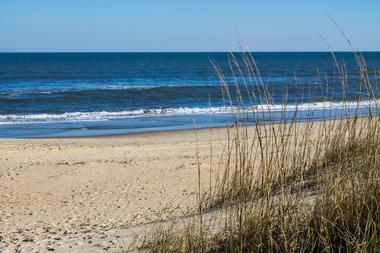 The Virginia part includes Chincoteague National Wildlife Refuge and about 1 mile of beach. The Maryland part includes most of Assateague Island National Seashore and Assateague State Park. The island is known for its feral horses, the historic Assateague Lighthouse, and spectacular beaches. The island is a heaven to explore, with its marshes, coves, and bays. There are bridges that connect the island with the mainland but there is no road that runs across the whole island. South of the Virginia border is the Chincoteague National Wildlife Refuge, a heaven for migratory birds, especially snow geese. 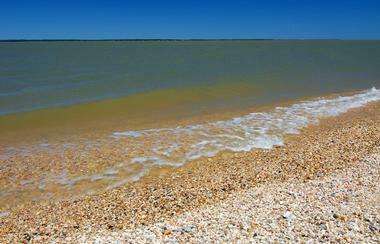 Bethel Beach Natural Area Preserve is located in Mathews County, Virginia, close to Chesapeake Bay. This 105-acre sandy spit of diverse habitat with salt marshes and low dunes constantly changes as the water and wind move and reshape it and its narrow yet lovely sandy beach. It is a wonderful hiking and bird watching area, with tidal lagoons, shrubby swamps, a small bay, and deeper channels. The whole area is thriving with life, such as the endangered northeastern beach tiger beetle and thousands of birds. While the area is open to the public, some sections are occasionally closed to protect its animal inhabitants, especially birds during nesting times. Snuggled along Chesapeake Bay, Buckroe Beach is one of Hampton’s most popular beaches, with 8 acres and ¾ of a mile wide sand, a kids’ playground, three picnic shelters with grills and tables, hiking and biking paths, and plenty of parking. Lifeguards are on duty during the summer season. Every Sunday throughout the summer, there are traditional Groovin' by the Bay concerts. Tuesdays are reserved for outdoor movies, a part of the Family Movie Series. The beach is excellent for swimming, and paddleboats and kayaks are available for rental. No dogs are allowed during the summer months. Located about 10 miles from the Chesapeake Bay Bridge Tunnel, on Virginia's eastern shore, Cape Charles is a charming small coastal town with a lovely public beach stretched along Bay Avenue and with easy access from almost every block. The beach is very popular with families with kids because the water is clean, shallow, and warm with no waves at all, making swimming a delight for the kids and peace of mind for the parents. There are two wooden access points with benches and view platforms that offer the perfect spot for watching magnificent sunsets. There is also a nice fishing pier and a pavilion with benches for public events and celebrations. Chesapeake Beach, known among the locals as Chic's Beach, is one of the most popular beaches in Virginia Beach. 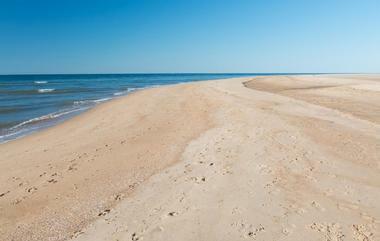 This lovely stretch of sand runs for about 2 miles between the Lynnhaven Inlet and the Chesapeake Bay Bridge Tunnel. The area was developed as a beachfront residential community in the early 1900s and was used as a lookout during WWII. The area was known for Chic's, a popular place selling ice cream and limeade. It is a neighborhood of single-family homes, condominiums, beach cottages, duplexes, and apartments. Popular Ocean Park is also stretched along the beach, and hiking and biking is great along the sandy edge of the water. The Little Creek Naval Amphibious Base is located at the west side of the area, connecting long stretches of protected beaches, which harbor marine life. Popular activities on the beach are boating, jet skiing, paddleboarding, hiking along the beach, and making sand castles. The beach at Chincoteague National Wildlife Refuge is considered one of the most beautiful beaches on the Atlantic coast. The windswept sandy barrier island is very popular among beach lovers, who can choose between the wild beach, Toms Cove Hook, and the recreational beach. Swimming and sunbathing attract a large crowd every summer and lifeguards are on duty to make sure everyone is safe. The recreational beach is also popular with birders, beachcombers, photographers, anglers, and nature lovers. Crabbing, clamming, kayaking, and surfing are also popular. 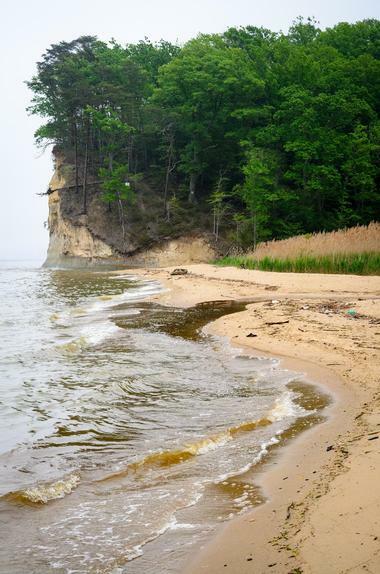 Wild Beach is an 11-mile-long paradise for hikers since no cars are allowed. Toms Cove Hook offers fantastic 10-mile walks along the ocean to Fishing Point. The fragile dunes along the hook are considered closed conservation areas. 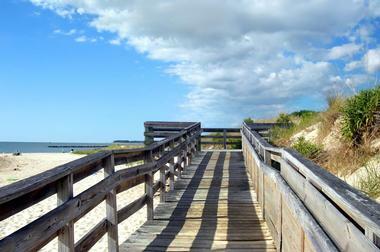 First Landing State Park is a 2,888-acre park located on Cape Henry in North Virginia Beach. This coastal haven offers a range of activities, such as swimming, boating, hiking, biking, fishing, or having a picnic. For overnight stays, there is a campsite or the park's cabins. 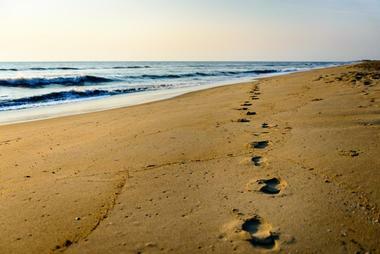 The beach is one and a quarter-mile long, located on the Chesapeake Bay. There are no lifeguards on the First Landing's beach and no swimming is allowed at the boat launch area or in the Narrows. The beach is mostly uncrowded and the water is warmer and calmer than in the Atlantic Ocean, perfect for small children. 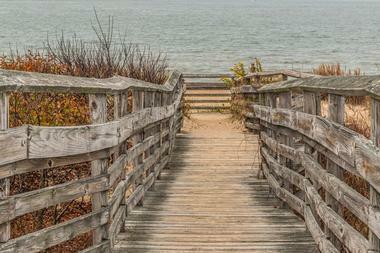 There are marked entrances to the beach with boardwalks across the dunes to protect the fragile dunes’ plant life. The beach is mostly clean and the sand is white and very fine. 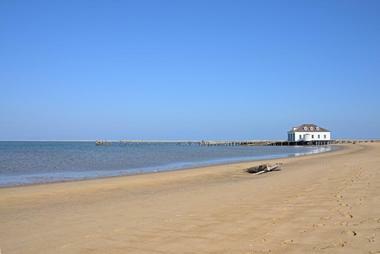 Colonial Beach is a charming small resort town on the Potomac River, famous for its 2.5-mile long beachfront. The town developed as a resort destination for the people from Washington D.C. in the early to mid-20th century, and is the only town with a coastline on the Atlantic Ocean as well as Chesapeake Bay. The town has rich history and some very notable former residents, but the biggest attraction is the beach. It is hard to believe that the beach is actually on the Potomac River, which is 6 miles wide at Colonial Beach. Parallel to the beach is the famous boardwalk, where most of the tourist life happens. Besides swimming and sunbathing on the beach, you can rent a kayak and paddle the river’s calm waters, watch the ospreys in their nests, fish from the long pier, or watch the boats passing by from one of many riverfront restaurants. 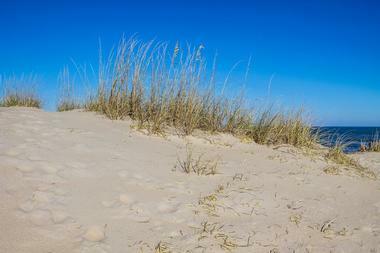 Kiptopeke State Park is located on Virginia’s eastern shore. Until 1964 the area was used by the Virginia Ferry Corporation as the terminus for the Little Creek-Cape Charles Ferry. The park has access to Chesapeake Bay, offering a range of recreational opportunities such as hiking, biking, and observing migratory birds that are nesting along the flyway. The park has a boat ramp, a fishing pier, several picnic areas a, kids’ playground, and over 5 miles of biking and hiking trails. For those who want to extend their stay, there are comfortable cabins, a campground, six-bedroom lodges, a yurt, and a bunkhouse. It is a quiet and peaceful place, perfect for those who want to unwind and relax surrounded by nature. Norfolk's Ocean View has 7.5 miles of spectacular public free-access beaches along Chesapeake Bay with calm waters that are perfect for swimming, sunbathing, and playing. Large commercial piers offer tackle rentals and bait shops and are an excellent location for crabbing and fishing. Along the beach is Ocean View Park, with a number of shady trees, a gazebo, several picnic tables, and a bathhouse. It is one of three well-organized and maintained parks on the beach. The quiet bay waters are perfect for kids, paddleboarding, and kayaking, while the flat hard-packed sand is great for jogging or leisurely strolls along the water. Virginia Beach is a charming small coastal town a few hours from Washington D.C. known for being the longest pleasure beach in the world. The popular tourist destination of Virginia Beach is a combination of history, entertainment, and beautiful nature. Along the Atlantic Ocean, from Croatan all the way to the north end of the city beach, is the Resort Area, the most popular and most lively part of town. Here, you can find all kinds of live music, street performers, food vendors, outdoor cafes, and a 3-mile long boardwalk that parallels the beach. It is the place for jogging and rollerblading, for coming off the beach for a cold drink, to have a bite to eat, and people-watch. The beach is very popular with surfers, swimmers, and sun-worshipers and lifeguards make it safe for the kids as well. 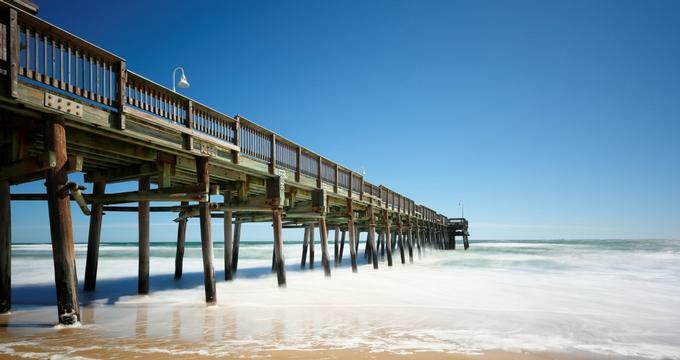 Only 15 minutes south of Virginia Beach’s bustling, lively Resort Area is Sandbridge Beach, known as the “Outer Banks of Virginia," 5 miles of magnificent golden sands stretching along the Atlantic Ocean. This quiet, peaceful beach is surrounded by 5 miles of massive sand dunes and lush, blooming sea oats, a perfect secluded oasis for family outings. If you are looking for more than splashing in the quiet, clear waters or simply strolling along the beach, you can explore the surrounding marshes and vast open waters of the Back Bay National Wildlife Refuge as well as False Cape State Park, both known for great hiking, kayaking, and fishing. Westmoreland State Park is a 1,311-acre protected area that stretches for 1.5 miles along the Potomac River on the Northern Neck Peninsula, near Montross in Westmoreland County, Virginia. The Horsehead Cliffs are the best spot for fantastic views of the river, which is 6 miles wide at this point. The lush secluded park offers seven hiking trails covering 6 miles, excellent fishing with boat ramps for fishermen, camping, lodging in 26 rustic cabins, and swimming both on the river beach and in the park’s pool. Westmoreland State Park was established in 1936 and is one of the six state parks built by the Civilian Conservation Corps. Close to the park is Stratford Hall, the birthplace of Robert E. Lee as well as the birthplace of George Washington.